The first and fundamental question is that what bones can we use? 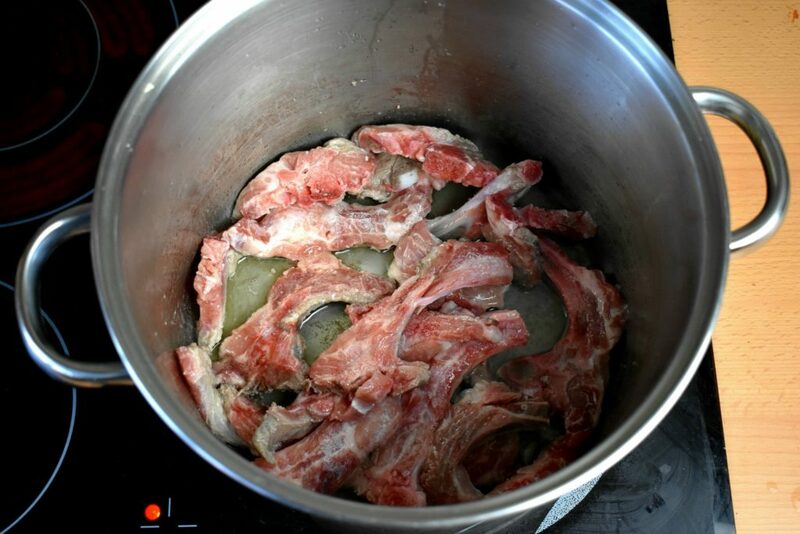 The best bones for bone broth are the ones with fat, skin and meat around them. Ribs, legs, feet, head or basically anything that we can’t or don’t want to use otherwise, goes into the soup. The more stuff we can put in, the tastier the broth will be. It’s important though to check the quality of the meat or bones when buying it. Not only because it’s healthier for us to eat healthily raised animals but because the soup will simply taste bad. Pork and beef are much less expected to have bad flavor than chicken. 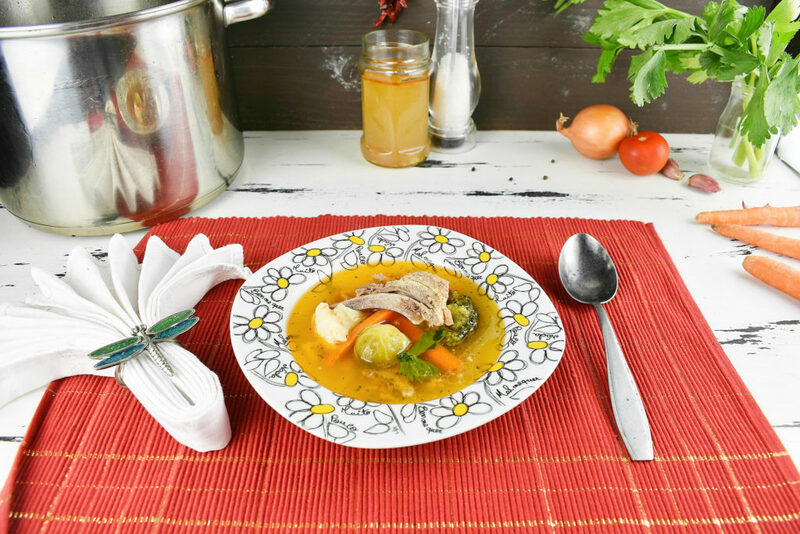 Chicken broth can be absolutely horrible if not made from pasture raised poultry. 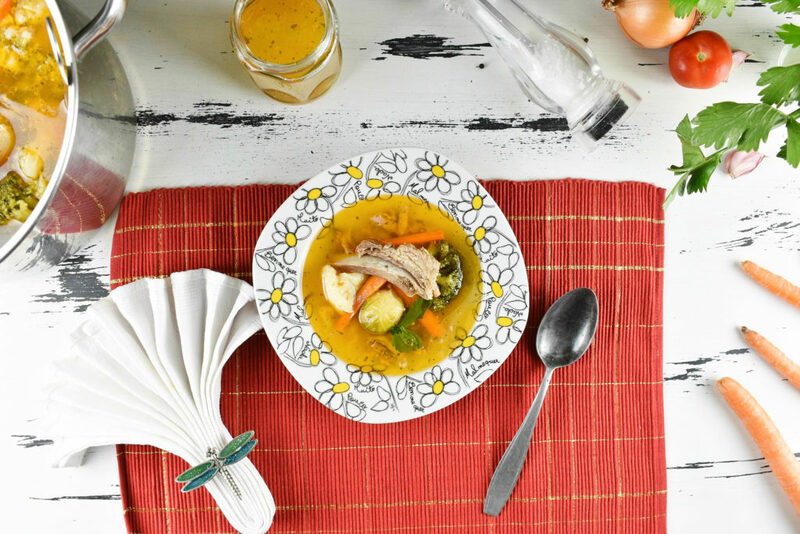 Where to get bones for bone broth? Buying bones can be a tricky business as prepackaged meat don’t really come with huge bones inside. Sure we can bone a whole chicken nice and quick in the coziness of our kitchen with a lovely knife in five minutes or even faster to get the pork ribs and blades done but the real treasure here will be a golden butcher who does everything we want only for our smile. There is no specific amount of bones required to make a great broth but generally the more it is, the better it tastes. 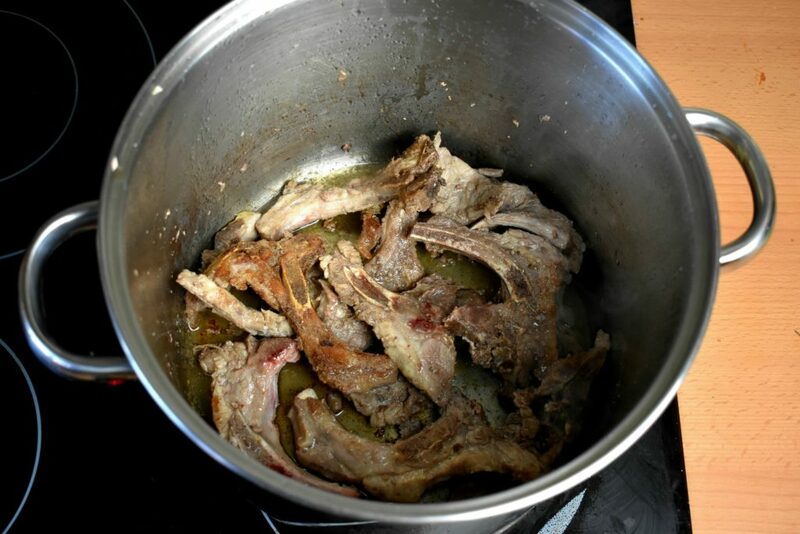 Bones can be frozen down and used straight away from the freezer when we have enough of them for a nice pot of broth. Also, we can use them even in small amounts to liven up other long cooking soups like beans, lentils or chickpeas as well. It’s an option to put the bones into the oven and bake them there, until they get the desired color. That way we can leave the searing out and basically just throw everything together in a big pot and cook it on low heat until it’s done. Well, actually it isn’t recommended cook all the vegetables for hours as beside they get soggy and slimy, they loose all their textures, vitamins and nutrients, as well. Luckily, some of those got absorbed into the water and if we keep the lid on the pot then we can benefit from them. But still, we loose the fibers and textures of vegetables which isn’t really healthy nor nice to chew on. 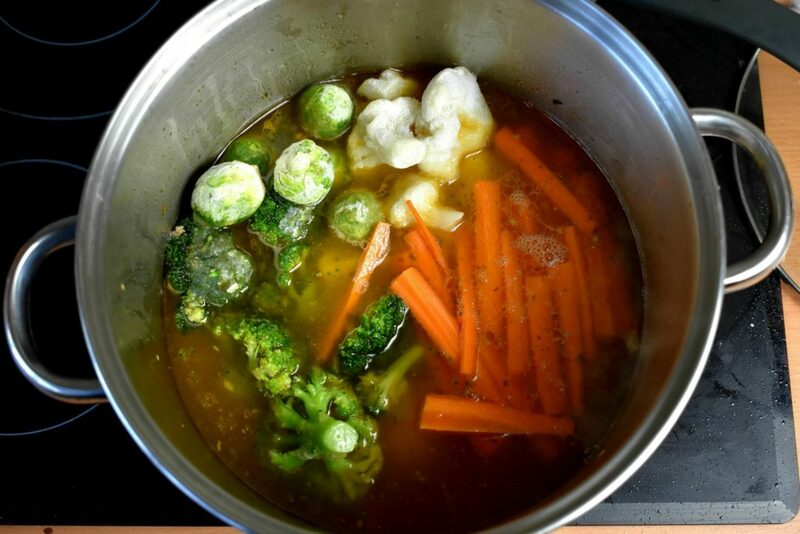 Perhaps the best way to cook the vegetables in the broth is, by adding the vegetables shortly before the end of cooking. This way we can cook them the recommended time, keep their texture, taste, and nutrients. 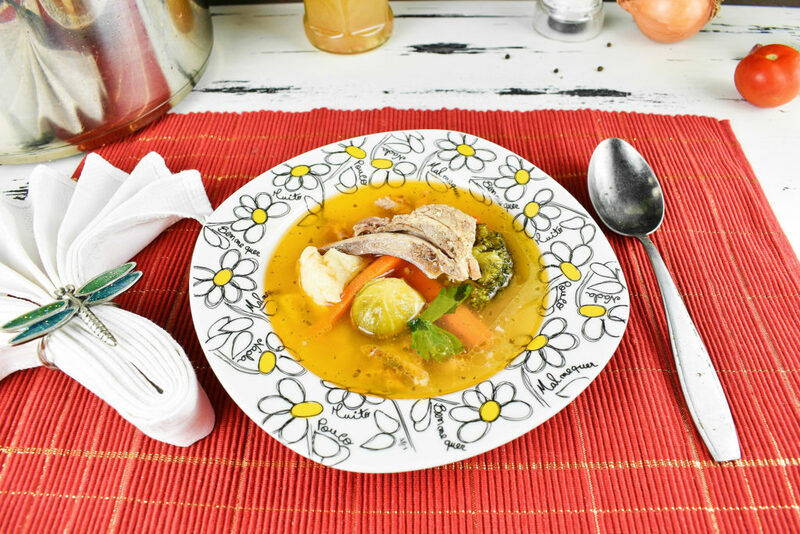 Keep in mind that during the cooling period the soup will still be hot for long enough to cook the vegetables more so if we like them crunchy then taking them out right after the recommended cooking time is the way of preparing them. In case we are after some extra calories then we can prepare some small size pasta -like alphabet pasta, macaroni, noodles, or acini di peppe- for the bone broth soup as well. This will thicken it up a bit and provides a fun extra texture to it. Take a cup of broth out into a small pot then add a half cup of pasta into it then cook until it’s done. Depending of the size of the pasta this is done in about one to three minutes. Pour the oil into a big pot and heat it up to medium. 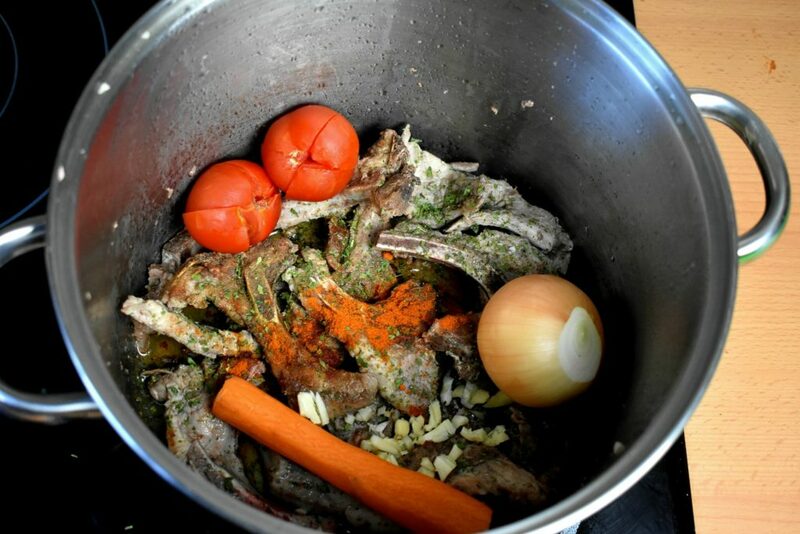 Place the bones onto the oil and fry them on all sides possible. Avoid burning them black. We are a after a nice golden brown color here. Add the water, tomato, onion, paprika, chives, parsley, black pepper, parsnips into the pot. Put the lid on and bring it to boil. Boil it on low heat for at least an hour. We are after nice little slow bubbles here. Prepare the rest of the vegetables and add it to the soup. 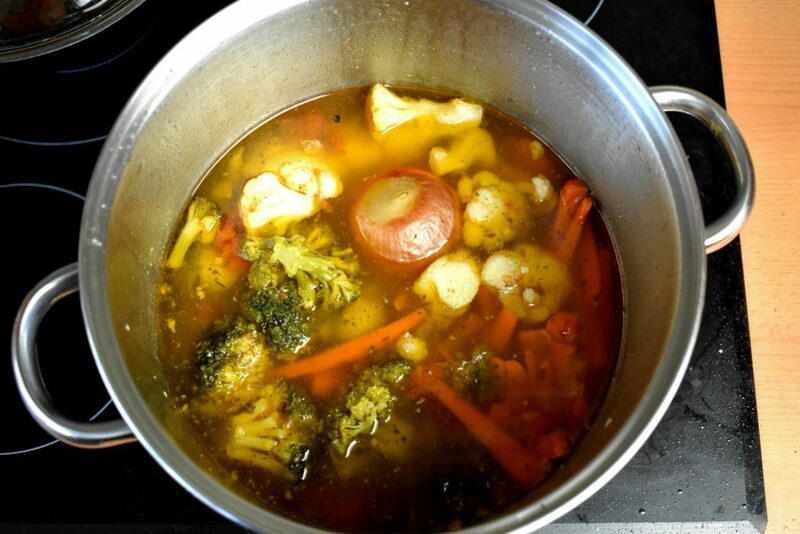 In case the vegetables are not immersed in the broth we can add more water to it. Put the lid back on, bring it to boil then turn it back to low heat until the vegetables are cooked. After 5 minutes check if the vegetables are cooked according to taste and cook it more if necessary. Mind that during the cooling step the vegetables will further be cooked in the hot broth so under cooking them a bit may be better than overcooking. Taking the cooked vegetables out and serving them separately is also an option. Take the pot off the heat and let it cool down a bit with lid on for at least half an hour before serving. 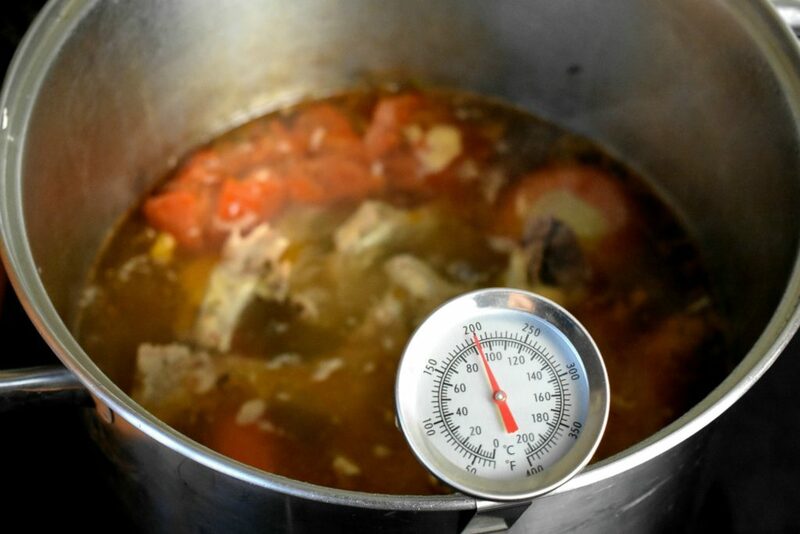 This allows the flavors to bend together nicely in the broth. Add the water, carrot, black pepper, salt, parsley, tomato, onion, paprika, chives, parsnips into the pot. Put the lid on and bring it to boil. It’s really easy recipe and delicious! I’m really happy to find this site! Thanks a lot! We are happy that you’ve found us too!